BEST TIME TO VISIT:Spring/Fall. COMMENTS: To get there take Hwy 140 to Cathey's Valley, turn on Hornitos Rd to Hornitos. Located about 3-1/2 miles north of Hornitos. The remains of Quartzburg were obliterated during construction of J-16 (Bear Valley-Hornitos Road). You can pause on the roadside where Burns Creek crosses the road, but there's nothing left of the town. Property is privately owned and trespassing forbidden. REMAINS: Fragments of an olive tree on the side of Bear Valley-Hornitos Rd. Placer mining gave way to numerous quartz discoveries in September 1850. Colonel Thomas Thorn, Quartzburg's first Post Master brought ten slaves with from Texas and established a store and lodge of sorts. Legend states he drove out undesireables from the district. A school was in operation there as early as 1851. Also a Masonic Lodge, bowling alley and regular streets. Max. population probably a few hundred at it's peak. Colonel Thorn's friend James Gaines also of Texas founded the Mount Gaines Mine a few miles north which became one of the largest producers in the county. Thorn, who became Quartzburg's most notable citizen, died in 1854. By then the fortunes of the town were already on the decline. Quartzburg is famous as the place where the California Rangers were mustered into service for the capture of the famous Mexican bandit, Joaquin Murrieta, in May, 1853. Several of the rangers were mining in the area at the time. Prior to this, in 1851 prominent quartz miners called a convention here to frame much-needed quartz claim regulations, which eventually became the standard throughout the state. 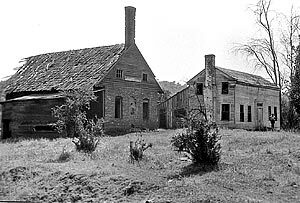 Nearby Hornitos became the new home of several of Quartzburg's settlers. Submitted by Joshua Reader.